On Supergirl Season 4 Episode 17, Supergirl faces her biggest challenge yet as she must deal with the destructive aftermath of Lex's nefarious plans. On Supergirl Season 4 Episode 16, Lex Luthor reveals all about his daring plan to rid the world of Supergirl, but how far will he go to win the battle? 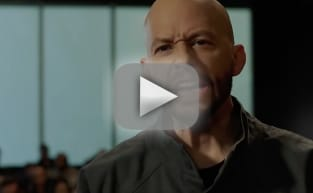 On Supergirl Season 4 Episode 15, Lex Luthor gets a furlough from prison due to ill health, but what is the villain's master plan to take down a hero? On Supergirl Season 4 Episode 14, with Ben Lockwood's push to stir up the anti-alien movement, Supergirl is worried about the safety of both humans and aliens. "What's so Funny About Truth, Justice, and the American Way?" On Supergirl Season 4 Episode 13, Supergirl pulls double duty as she tries to apprehend Manchester Black and his team and deal with a shocking new development. On Supergirl Season 4 Episode 12, Kara decides to team up with J'onn on his latest P.I. assignment but it ends up tying directly into Alex's current situation. On Supergirl Season 4 Episode 11, Nia is encouraged to embrace her destiny and Alex deals with a drug that turns people violent and gives them superpowers. On Supergirl Season 4 Episode 10, Colonel Haley and Supergirl clash when she handles a distress call from a Navy ship that turns out to be an alien attack. On Supergirl Season 4 Episode 9, the Elseworlds crossover continues, and Cisco continues to cause problems for his former friends. Can anyone get through to him? On Supergirl Season 4 Episode 8, Kara and Brainy try to persuade Nia to embrace her destiny after she has a powerful dream about Agent Liberty. Beth: You know it's true what they say, behind every great man is a strong woman. Lena: I wouldn't know, I've never stood behind a man. Permalink: I wouldn't know, I've never stood behind a man. Winn: I try to stay out of people's relationships. Alex: Like you stayed out of Kara's relationship? Permalink: Like you stayed out of Kara's relationship? Supergirl Promo: What is Lex Luthor's Plan? Elseworlds Trailer: Time for a Reality Check! Supergirl Season 4 Trailer: So. Many. Changes.